Could this account for its delay? 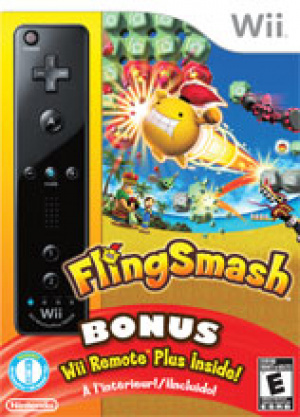 We played FlingSmash in February of this year and quite enjoyed it, as our First Impressions show, but its projected release date of Summer 2010 has been and gone without the game hitting shelves. Now retailer Gamestop has released boxart of the game showing the game is set to be bundled with a Remote, seemingly containing MotionPlus built-in. Titled "Wii Remote Plus", the controller itself looks only slightly different, with a slight curve below the four lights the only alteration visible at this resolution. As FlingSmash requires MotionPlus this is obviously a new controller containing the add-on, but could the game's delay have been caused by the newly developed Remote? We'll bring you new information on FlingSmash and the Wii Remote Plus as it emerges. Still I wonder why Nintendo seemingly decided to make this their new showoff title for Wii Motion Plus. It's a nice game for sure, but nothing spectacular. And let's face it, without Zelda: Skyward Sword, how many MotionPlus games are actually on the way to Wii..? At last the Wiimote how it was supposed to be. what happens when you plug the wiimotion plus into the wii remote plus?!?!?! Is this a game you can only buy with another Wii remote? 'Cos I certainly don't need another one, even if Motion Plus is already built in. I've got enough Wii paraphernalia to fill a basket as it is. My guess is it'll be available separately too, especially in Europe where MotionPlus has been bundled with consoles for the past year or so. @ James: I know there are basically no more WiiMotion Plus games on the way...but then Nintendo should go and out and create some! Especially when they are trying to push the hardware with this new bundle. I wonder if the Motion Plus being built-in means that the Wii Remote is 'hard-enhanced' and now better for ALL games or if it still treats the new tech as an add-on and thus incompatible with older games. Knowing Nintendo, it's probably the latter. But if it's the former I'll take four, please. @ Shugo: That would be impossible as alternative control methods would need to be programmed into the game itself. Well, I hope the bundled price isn't too high. I thought this looked like a budget release, but it sounded like they were going to go for a £29.99 price point. I've got two Motion Plus units already from getting Sports Resort and Red Steel 2 bundled, but given I presently only have four remotes for two Wiis I can always use another. I also plan on getting that sweet Tron controller! Anyways, killer news! As I can't stand the motion Plus dongles. Hmmmmm, don't know if I'll want the remote or not, I don't mind Motion+ itself all that much, and already have 2. But, I was already interested in FlingSmash, so I guess I'll be getting one anyway. And, ummmm, are we getting ANY new info on the game by the way? (aside from the possible bundle). This'll be cool. I hope it doesn't cost more than the current bundle. Been looking forward to this for the while. This may explain the increase in price from $30 to $50. They should have had this to start with. @James Newton The Grinder I believe was mentioned to have Motion Plus support. Mario Tennis with MotionPlus, please. this could just make the game worth the purchase for me. thanks, Ninty! Now THAT is good marketing. I was going to buy this, now i'm going to buy two copies. This is great, I wanted a Black Wiimote and WM+ to match and was going to buy this game so now I'll just get the bundle and I'll be set. I don't care about the game I just want the remote. Feels like too little too late at this point now that Move is out. Plus plugging in a WM+ adapter to a regular Wii Remote isn't all that hard for the maybe 5 games that use it. Well..... I do have 3 remotes...... Gonna get it anyways! And also, it's about time! If I didn't already have three motion+s, I would be all over this. Looks cool, but will you be able to take it off? Oh boy I only needed 1 more remote to have 4, which I thought I was getting with Wii Party, but it now looks as though I'm going to have an extra. Strange for Nintendo to release to games bundled with a Wiimote within a month from each other. yes!!! i think if they really go with this then wii games are going to get a lot better! wait this works for normal wii games AND motion + games too right? Of course it will work for all games, but the games have to be programmed to detect and use the MotionPlus enhancements. Otherwise it will be like you don't have the MotionPlus attached to the Wii-Mote. Holy moley, I might just get the game now! No more having to take off that MotionPlus stub anymore! I never take off my MotionPlus so it's not really an issue for me. But I think they should have done this earlier. Saves on plastic at any rate, so having it built into the controller must automatically be cheaper than buying a $40 remote and then a $25 dongle-mabob. I'm kind of interested in the game so adding this remote to the package makes it an even sweeter deal. I just hope that the game is actually good. Meh. Whatever. Does anyone think my avatar looks cheezy? @WarriorCatFreak: No...it suits you. Assuming you are a warrior as well as a Cat Freak like your avatar implies.